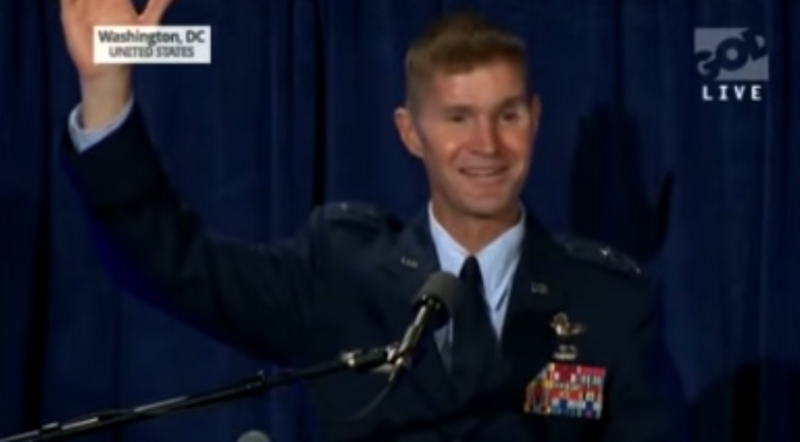 Major Gen. Craig Olson was among a number of distinguished guests at the Washington, D.C. observance on May 7, and presented a 20-minute speech about his personal testimony and the power of prayer. “I’m thankful that I’m a redeemed believer in Christ standing here right now,” Olson told those gathered, receiving applause. He said that he came to Christ as the result of a Bible study at the Air Force academy, and has since learned to depend upon God for every task that he has been assigned to. He asserted that Olson’s speech violated the Establishment Clause of the United States Constitution, as well as military regulations such as Air Force Instruction 1-1, Section 2.12, which prohibits superiors from engaging in the appearance of a government endorsement of religion. Consequently, Weinstein asked that Olson be court martialed for his speech before the event. “[T]he Military Religious Freedom Foundation (MRFF) hereby demands that Major General Craig S. Olson be immediately, aggressively and very visibly brought to justice for his unforgivable crimes and transgressions via trial by General Courts Martial and that any and all others who assisted him with his NDPTF speech of fundamentalist Christian supremacy be likewise investigated and punished to the full extent of military law,” he wrote.